This is being re-sent because the exclusive glove giveaway link was incorrect. Sorry for pestering you with 2 February mailings, but I wanted you to have a chance to win those nifty gloves. This month I’d like to give a shout out to three gear companies who are getting serious about making a positive social and environmental impact. There are some great giveaways to share with you, too. And because I’ve been trapped indoors (due to stormy weather and unanticipated life events), there are a LOT of new reviews and articles. I’d be thrilled if I could entice you into a winter hike, using some of those tips and top notch gear to stay warm and dry. February, the shortest month on the calendar, gets very little hiking love in the Northern hemisphere. So please use my latest batch of gear reviews to keep yourself comfortable as you enjoy a winter hike during a safe weather window. REI Co-op has been highlighting a series of “What’s your but?” questions, highlighting the fact that sometimes people stay off the trail because they don’t know how to take that first step toward solving a problem. Sounds like something Hiking For Her could lend a hand with, so here are several articles to tackle some “buts” (which sounds vaguely football-ish - but no quarterbacks were harmed in the writing of any of them). But what if I gain or lose weight? Adjustable gear to the rescue! I'd love to try backpacking, but where to start? Overnights! Hiking is great, but I hate feeling grimy. Hygiene tips to the rescue! I make no secret of the fact that I’m keen on Keen footwear for the trail: out of the box comfort, smart designs, decent price points, and reasonable durability. Now there's another reason why female hikers like me can support the brand: KEEN announced the opening of a child care center at their Portland OR headquarters. While providing child care for workers isn’t a new idea (although it was radical a few decades back when my kids were young), it’s somewhat of a rare move in the outdoor retailer world (Patagonia being an enlightened pioneer). But doesn’t it just make sense to provide on site care for infants and toddlers so parents can focus, be productive, and visit their well cared for kids during breaks? It feels good to wear boots made by less stressed parents! Anyway, just my opinion on what looks to be a win-win scenario for KEEN wearers. I’d love to hear your thoughts about why you support particular gear companies. Just hit reply! ARE YOU A JELTER YET? Last month, Hiking For Her sponsored a Jelt Belt giveaway. Linda M. from Honesdale, PA was the lucky winner. Hiking For Her has no financial or affiliate relationship with woman owned JeltBelt, just respect for the way they show up in the world. Others are noticing, too: Jelt was awarded B Corporation status (the 7th company in Montana) for the solid environmental and social components in their business model. For starters, their product is created from 100% recycled plastic water bottles (good to know those are going somewhere useful, right?). The packaging is 100% recycled cardboard. But there’s a lot more to appreciate. Donations from every sale go to non-profits supporting veterans, children, and the environment: Warriors and Quiet Waters Foundation, THRIVE, and 1% For The Planet. And JeltBelt participates in the Montana Correctional Enterprise Program, employing incarcerated women to build work skills and experience. I’ll share a review of my own JeltBelt next month, in case you're not familiar with the merits of this brand. NEW SOLES IN YOUR FUTURE? Vibram has a new boot and shoe resole program so you can hang on to your favorite footwear just a little longer. Use their catalog to select the soles you’d like to see on your footwear, and they’ll do the rest. Again, no reciprocal relationship with the company, just some nostalgia. My first pair of Vibram soled boots, purchased in 1971, were well loved as I learned to backpack. Just thinking about them makes me smile: I called them my moon boots because they were so chunky and solid. So I wanted you to know that while this is not exactly a cheap option for acquiring new Vibram soles, it may be worth it for beloved leather shoes and hiking boots you aren’t willing to part with – or want to keep out of a landfill. You’ve only got a few more days to enter for your chance to win lovely, functional and comfortable trailwear from Lady Hike. Each month through the end of 2018, HFH is sharing a chance to win hiking gear. Specifically, comfort and safety gear. To celebrate ten years of sharing trustworthy hiking tips on the website! Time has flown, and since I can’t hike with you in “real life”, I can at least gift you with a chance to own happy trail gear. There is only 1 way to sign up each month: knowing the secret password shared in Happy Trails. Yup, I was so impressed with those possum down gloves (review link above) that I’d love for you to have a pair to carry year round, too. They're unique because of the New Zealand invasive species angle - and the hollow fiber down blended with Merino wool. These are not flimsy thin gloves: the quality and warmth on your hands are the real deal, much more so than fleece gloves. You may see a message pop up, telling you it’s not safe to open the giveaway link below. That might be true if you were initiating a financial transaction on the page. 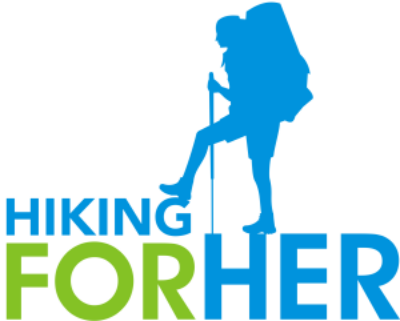 But because only your email address is being shared with Hiking For Her, and because HFH has a strict “no spam” policy, there’s no risk for entering the giveaway. Your email address goes no further than HFH, and is used only to communicate with you if (when!!) you win. Are you signed up for the HFH weekly updates yet? ... along with flash giveaways every so often. Flash, meaning they only last a few days and won't make it into this monthly newsletter. Are you missing out? There’s very little overlap between this newsletter and the weekly email update, so don’t worry about stale or recycled info. Why would I do that to you?! Only the good trail stuff every time, and that’s a promise. I hope you find time today to count up all of the marvels you enjoy as a hiker: fresh air, beautiful scenery, enjoyable trail friendships, the satisfaction of strong legs, and so much more. In this spirit of gratitude, I send to you my sincere thanks for reading this newsletter in the midst of your busy day.